Hey guys! long time no see.. I’v been overseas in New Zealand these past few weeks. Whilst I was away I noticed a lot of new people following the site. For that I say thank you and welcome! I’m back on the creative band wagon. Finishing up a painting, working on some logos and other graphic design material and I have some really exciting projects coming up! I’m also updating the site with a lot of content I missed out on uploading so feel free to grab a beer and have a look around. For the new people I will post some of my other links below. A photo I snapped at Franz Josef Glacier on the heli hike. Incredible experience. I recently picked up a 35mm camera and have been shooting quite a bit, the rest of the photos are in the photography section of the website. Finally complete the piece I have been working on for OMY restaurant. 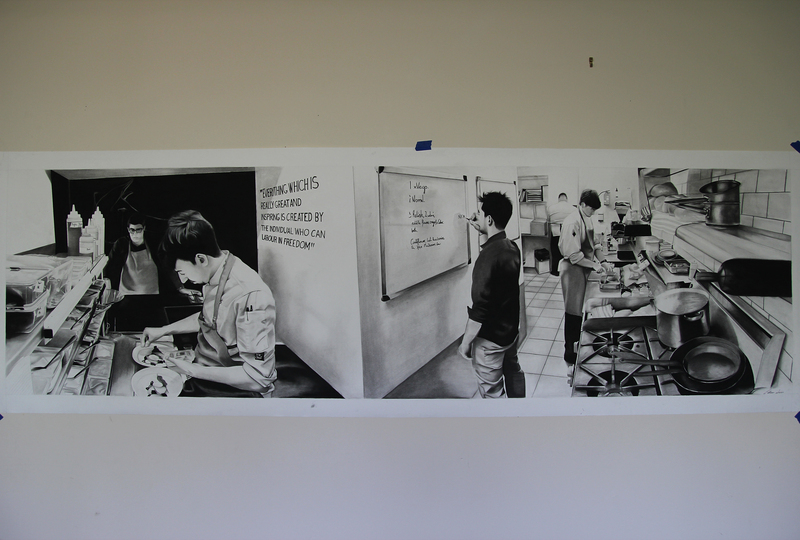 Its a panorama charcoal drawing of all the boys in the kitchen. Drawn on a 200 gsm watercolour paper, using a range of charcoal materials. The piece stretches out about 2.2 X 0.7 metres. Being by far the biggest drawing I have completed. I had a lot of fun working on it and can’t wait to see it hanging up on the walls of the restaurant. If you live in or local to Melbourne Australia I can’t recommend the OMY restaurant in Beaconsfield enough! Subscribe via email on the right panel if you want to see future work of mine. Thanks for looking! These are some Panorama photos I took while on vacation in Cairns Australia in locations like Mossman Gorge, Green Island and The Barron Falls. More drawings coming soon!